Welcome author Allie Frost to PNR&More for an interview! Read on below for our interview and to learn more about her book I'm With You. My name is Allie Frost! I am a dedicated consumer of dark roast coffee, a fan of YA and fantasy fiction of all kinds, and a lover of rainy afternoons. Outside of writing, I enjoy reading, traveling, playing video games, going for long, leisurely strolls, and watching movies. I’m With You is a story about family, the many faces of love, and the importance of “home.” Though it’s a YA novel and mainly follows a fifteen-year-old boy named Ciarán and his little sister, Remiel, they are joined on their journey by characters from various stages of life with their own stories to tell. Each person has a role to play in the overall plot, but the heart of the story is the exploration of their personalities and their growing relationships with one another. It’s always characters first, for me. Readers connect to the characters, so it’s vital for them to be relatable, even if a story is set in a fictional world. In I’m With You, the characters are the backbone of the story, and I wanted readers to be invested in their individual journeys and experiences. Where can we purchase your novel? 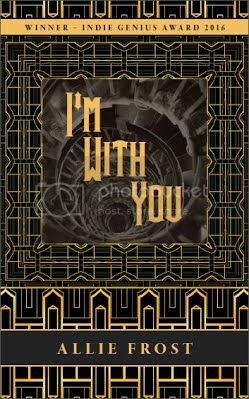 I’m With You is currently available on Amazon in print and ebook format, and in print from the Barnes and Noble website. Also, the ebook is currently $1.99 for a limited time (down from $4.99)! I’d like to venture into sci-fi since I’ve always loved sci-fi books and films. There are endless possibilities to explore in a genre like that. Do you think you will have a follow-up book to this novel or is it just a stand-alone novel? It might end up as a stand-alone, but I’ve been playing with potential “side stories” told from the POV of the supporting characters. Each chapter would explore different characters and give insight into their lives pre (or post) I’m With You. I don’t think I’ll ever do a direct sequel, but a companion novel might be a fun way to show what it’s like inside the heads of the lesser-explored characters. I’m hoping to have at least one (if not more) full YA series completed in the next five years. I sort of fell into it by accident. I’d recently graduated from college and had finished a draft of I’m With You, but it was just collecting dust on my computer. One night, while researching different routes of publishing, I stumbled across a contest held by Dragon Tree Books that included a publishing package. I decided, “Why not?” and submitted my manuscript, and a couple of months later, I found out I’d won. I appreciate the response my work has received and I am always eager to hear from readers! It’s incredibly rewarding to know that people have enjoyed my writing, and I hope those who liked my first book will look forward to the stories I have yet to tell. It may sound simple, but the best part for me is being able to express my ideas and thoughts in a creative fashion. Writing allows me to bring characters and worlds that I’ve been planning and thinking about to “life,” in a way, and it’s a great feeling to look back on a story or a chapter and see those ideas in action. And when I get to share them with others, it’s even better. Gray. Boring, I know – but it goes with everything!